Like the late fashion designer Alexander McQueen, Wendell Castle creates functional objects imbued with elements of fantasy in a way that so few artists have been successful. He has combined these elements into a practice that isn’t purely theatrical or cliché. He belongs to the legion of artists like Salvador Dali who have pushed these ideas into the dialogue about art and culture. At the base of this project is a real world experience that transcends the mundane and teaches us how the impractical can move us forward. 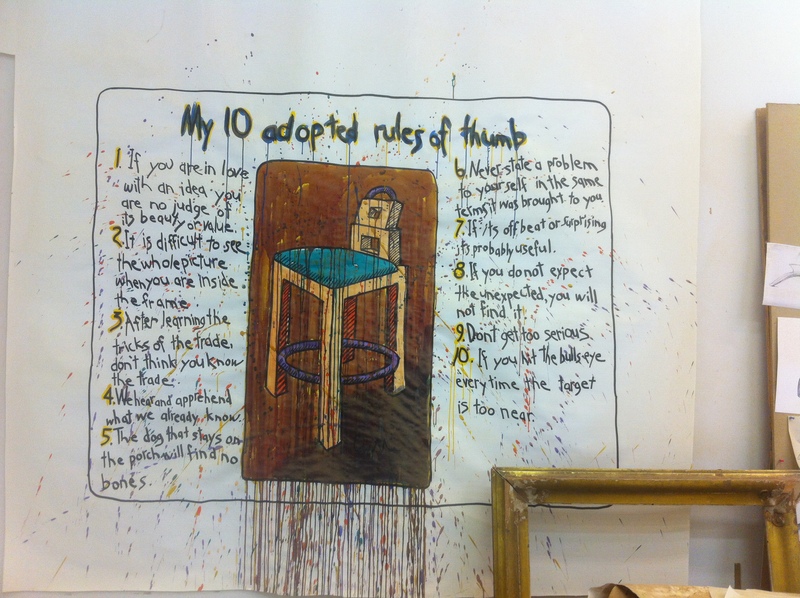 The rules hang in Wendell Castle’s studio. 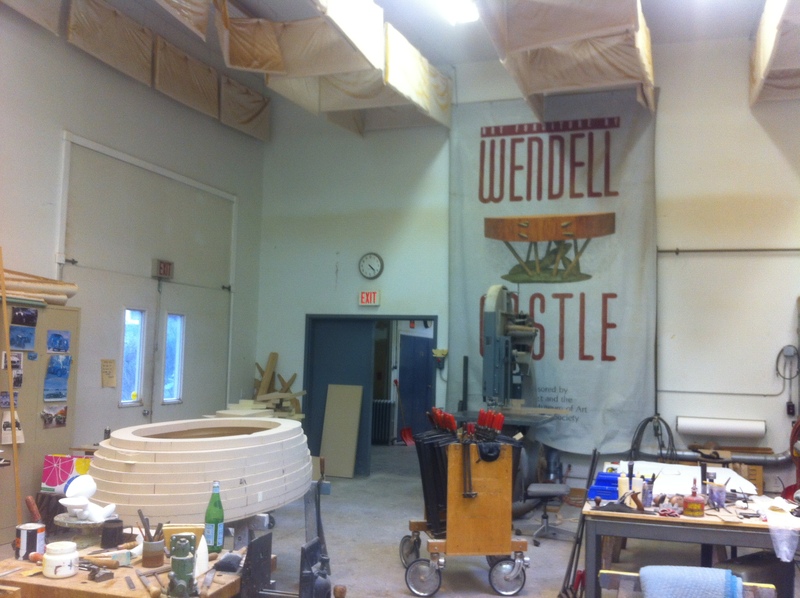 Since my studio visit with Wendell in October, the Dec/Jan issue of American Craft published Wendell Castle’s New Rules for Creativity. Bring conflicting attitudes to bear on the same problem. We should never know for whom you’re designing. Always listen to the voice of eccentricity. The whole secret to designing a chair is applying the seat of your pants to the seat of the chair. The problem with taking life in your own hands is you have no one else to blame. If your mind is not baffled, your mind is not fully employed. Imagination, not reason, creates what is novel. Jumping to conclusions is not exercise. Keep knocking- eventually someone will look down to see who’s there. This Fall, as part of a series of Wendell Castle exhibitions commemorating the artist’s 80th year, the Kentucky Museum of Art and Craft will present Wendell Castle: Forms within Forms from November 30, 2012–February 4, 2013. His two galleries in Chelsea, Friedman Benda and Barry Friedman will be presenting brand new work and the Aldrich Contemporary Art Museum will focus on his vintage work. In preparation for the upcoming exhibition at KMAC I visited Wendell at his home and studio in Scottsville, a small village outside of Rochester, NY. We discussed his methods for designing one-of-a-kind hybrid utility based art pieces, particularly the innovative stack-laminated wood process that he has been using for over 5 decades. Though our focus here at KMAC will be Castle’s more recent sculptural furniture pieces I think it’s important to provide viewers with a context for his forward thinking designs and the influence that other forward thinkers have had on his work. 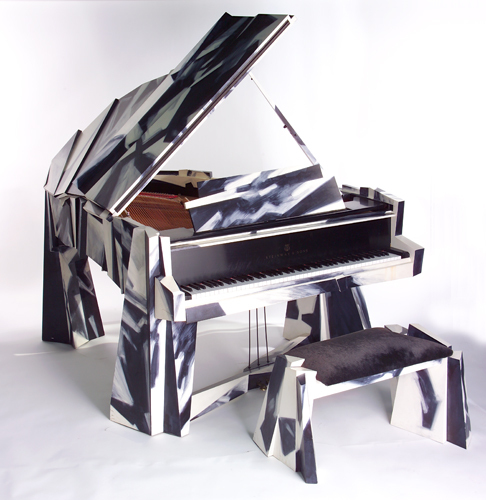 Wendell’s Calagari piano (1990) for example, can certainly be viewed as a homage to Herman Warm’s set designs for the classic 1920 horror film The Cabinet of Dr. Caligari, but also to the radical and “futuristic” designs of constructivism, german expressionism and Bauhaus. Inspired by the avant garde artists from these early 20th century movements, Wendell’s early work seemed to reflect an admiration for their fascination with the rapid industrialization of our environment. Twentieth century Modernism, as it pertained to the visual arts, was largely a response to the growing dependence on technology in the western world. Wendell was clearly influenced by European art and design from this time as well as the commentary on the growing trends of self-reflexivity and spectacle, especially as they were manifested in a culture that had been through the first world war. From the European avant garde we move to the late 1960’s when Wendell began a series of experiments in plastic. Despite the craft world’s reticence to immediately except this body work from a known wood worker, his original fiberglass pieces have now become sought after collector’s items and his newer work references these early triumphs. With Claes Oldenburg and other Pop artists adopting a shinier, bolder and brighter color palate Wendell begun using fiberglass in part due to his background in industrial design and his appreciation for cars. From the glossy finishes and smooth surfaces of his Molar Chair (1969) and Cloud Shelf (1969) Wendell has moved into 21st century retaining an interest in car design, but with more emphasis on the mechanics than the aesthetics of the automobile. 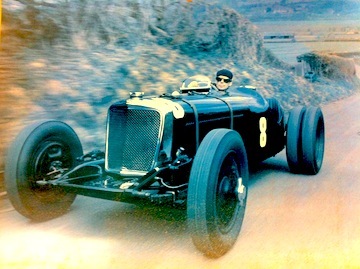 Inspirational Roadster image that hangs in Wendell’s studio. For the past five years Wendell has been working on a unique series of wooden rocking chairs that draw on the construction and physics of a car in motion. The primary connection between the automobile and the curvilinear form of his rocking chair is what is referred to as the camber angle. The camber is the angle of the wheels from top to bottom as it sits on the axle. This is used for the design of the steering and suspension of the vehicle. When the top of the wheel angles out farther than the bottom, it is called positive camber; when the bottom of the wheel angles farther out than the top, it is called negative camber. The other, more whimsical, gesture that Wendell incorporates into the design of the rocking chairs is based on a memory from his childhood. 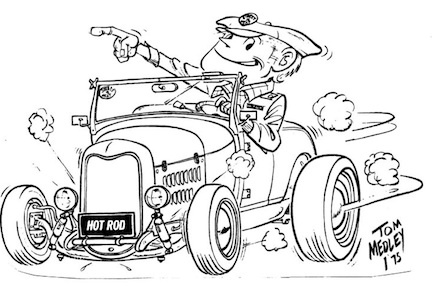 He noticed a specific way that many cartoonists attempt to capture increasing speed in a car. The animation of an accelerating car has become the primary detail in the look and function of his newest designs.